14k Gold CZ Cubic Zirconia Halo Style Asscher Cut Solitaire Engagement Ring. Asscher Cut Russian CZ in Solid 14K Yellow Gold or 14k White Gold. Unbelievable Price!! Russian Cubic Zirconia's are more precisely cut & polished of the best CZ quality available. The 6mm / 1 carat version is the most stunning and the perfect size. 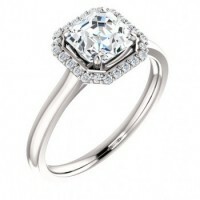 This item is also available with a variety of center CZ stone shapes. This item is a special order made just for you and takes 7-14 days.